Federal courtrooms are commonly accused of monkey business, particularly where the Ninth Circuit is concerned. That was certainly the case this week when a three-judge panel heard the case of an Indonesian macaque named Naruto. The simian, aided by human attorneys from PETA, was attempting to sue photographer David Slater for copyright infringement. It seems that the humanoid fur-baby allegedly grabbed Slater’s camera on a trip to Indonesia in 2011 and took a hundreds of pictures including several striking selfies. Without bothering to ask Naruto’s permission, Slater published the picture in a book after retrieving his camera. The monkey poo hit the fan when the pictures were posted to Wikimedia in a move that Slater said violates the copyright on his work and is costing him a fortune in royalties. The US Copyright Office saw things differently. In 2014, the agency clarified its guidelines on the issue, saying that works created by nonhumans are not subject to copyright. “Photograph taken by a monkey” is specifically listed as an example. Nevertheless, Slater continues to claim the copyright and has considered suing Wikimedia. The Ninth Circuit Court of Appeals is expected to uphold the earlier decision in favor of Slater and against PETA. 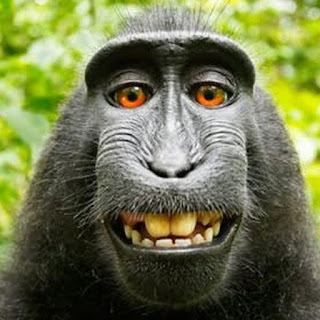 “It is absurd to say a monkey can sue for copyright infringement,” said Angela Dunning, Slater’s attorney. “Naruto can’t benefit financially from his work. He is a monkey.” PETA is “not even sure they have the right monkey,” she added. A British newspaper argued, “Hey, hey, it’s the monkey’s,” but Slater may have the last laugh. Another of his attorneys, Andrew Dhuey, said that PETA should be forced to pay legal fees for the nearly broke photographer. “Monkey see, monkey sue will not do in federal court,” Dhuey argued.